The year consisted of the fourth warmest winter, a record warm spring, the second warmest summer, and a warmer-than-average autumn. Although the last four months of 2012 did not bring the same unusual warmth as the first 8 months of the year, the September through December temperatures were warm enough for 2012 to remain the record warmest year, by a wide margin. The Weather Channel dug into the data and found another impressive number: the 114 weather stations administered by the NOAA recorded 34,008 daily record high temperatures (out of 41,724 daily records total). By comparison, the NOAA recorded just 6,664 record daily lows from the same stations. WASHINGTON (AP) — America set an off-the-charts heat record in 2012. A brutal combination of a widespread drought and a mostly absent winter pushed the average annual U.S. temperature last year up to 55.32 degrees Fahrenheit, the government announced Tuesday. That's a full degree warmer than the old record set in 1998.Breaking temperature records by an entire degree is unprecedented, scientists say. Normally, records are broken by a tenth of a degree or so. "It was off the chart," said Deke Arndt, head of climate monitoring at the National Climatic Data Center in Asheville, N.C., which calculated the temperature records.Last year, he said, will go down as "a huge exclamation point at the end of a couple decades of warming. "The data center's figures for the entire world won't come out until next week, but through the first 11 months of 2012, the world was on pace to have its eighth warmest year on record.Scientists say the U.S. heat is part global warming in action and natural weather variations. The drought that struck almost two-thirds of the nation and a La Nina weather event helped push temperatures higher, along with climate change from man-made greenhouse gas emissions, said Katharine Hayhoe, director of the Climate Science Center at Texas Tech University. She said temperature increases are happening faster than scientists predicted. "These records do not occur like this in an unchanging climate," said Kevin Trenberth, head of climate analysis at the National Center for Atmospheric Research in Boulder, Colo. "And they are costing many billions of dollars. "Global warming is caused by the burning of fossil fuels — coal, oil and natural gas — which sends heat-trapping gases, such as carbon dioxide, into the air, changing the climate, scientists say.What's happening with temperatures in the United States is consistent with the long-term pattern of "big heat events that reach into new levels of intensity," Arndt said.Last year was 3.2 degrees warmer than the average for the entire 20th century. Last July was the hottest month on record. Nineteen states set yearly heat records in 2012, though Alaska was cooler than average.U.S. temperature records go back to 1895 and the yearly average is based on reports from more than 1,200 weather stations across the Lower 48 states.Several environmental groups, including the World Wildlife Fund, took the opportunity to call on the Obama Administration to do more to fight climate change.According to the National Oceanic and Atmospheric Administration, 2012 also had the second-most weather extremes on record after hurricane-heavy 1998, based on a complex mathematical formula that includes temperature records, drought, downpours, and land-falling hurricanes.Measured by the number of high-damage events, 2012 ranked second after 2011, with 11 different disasters that caused more than $1 billion in damage, including Superstorm Sandy and the drought, NOAA said.The drought was the worst since the 1950s and slightly behind the Dust Bowl of the 1930s, meteorologists said. During a drought, the ground is so dry that there's not enough moisture in the soil to evaporate into the atmosphere to cause rainfall, which leads to hotter, drier air. This was fed in the U.S. by La Nina, which is linked to drought.Scientists say even with global warming, natural and local weather changes mean that temperatures will go up and down over the years. But overall, temperatures are climbing. In the United States, the temperature trend has gone up 1.3 degrees over the last century, according to NOAA data. The last year the U.S. was cooler than the 20th-century average was 1997.The last time the country had a record cold month was December 1983. What has scientists so stunned is how far above other hot years 2012 was. Nearly all of the previous 117 years of temperature records were bunched between 51 and 54 degrees, while 2012 was well above 55. Discovered: Global warming could cause more lava flow; humans started popping pills ages ago; babies begin acquiring language in womb; Mars astronauts would be very sleepy. See that deep purple in the middle of this acne-red weather report from Down Under? That right there represents 129.2° F or 54 °C — it's a brand-new shade that the Australian bureau of meteorology was forced to add to its heat index because their country is, you know, kind of on fire. "The scale has just been increased today and I would anticipate it is because the forecast coming from the bureau's model is showing temperatures in excess of 50 degrees," David Jones, head of the bureau's climate monitoring and prediction unit, told The Sydney Morning Herald, which notes that the previous record high was 50.7°C (123°F), recorded in 1960 at Oodnadatta Airport in the southern part of Australia — right around where the new shades of hot are showing up today. To give you an idea of just how uncomfortable this Australian heatwave really is, consider that at just past midnight, it's 95°F in Sydney. Doubly scary are the giant fire risks that come with the heat — risks so severe Australian officials are taking no chances and labeling the warning "catastrophic." "A 'catastrophic' warning carries the risk of significant loss of life and the destruction of many homes, according to the NSW Rural Fire Service," reports CNN. If the asteroid is as big as a 20-story building (200 feet on a side), it has an amount of energy equal to the largest nuclear bombs made today -- on the order of 25 to 50 megatons. An asteroid like this would flatten reinforced concrete buildings five miles from ground zero. It would completely destroy most major cities in the United States.By the time you get up to a mile-wide asteroid, you are working in the 1 million megaton range. This asteroid has the energy that's 10 million times greater than the bomb that fell on Hiroshima. It's able to flatten everything for 100 to 200 miles out from ground zero. In other words, if a mile-wide asteroid were to directly hit New York City, the force of the impact probably would completely flatten every single thing from Washington D.C. to Boston, and would cause extensive damage perhaps 1,000 miles out -- that's as far away as Chicago. The amount of dust and debris thrown up into the atmosphere would block out the sun and cause most living things on the planet to perish. If an asteroid that big were to land in the ocean, it would cause massive tidal waves hundreds of feet high that would completely scrub the coastlines in the vicinity. OK HERES WHATS GONNA HAPPEN! NEARING THE END OF THE 7 YEAR TRIBULATION PERIOD OR 7 YEAR ISRAELI/ARAB/MUSLIM PEACE TREATY SIGNING.SINCE THE OZONE LAYER WILL ALMOST BE DEPLETED FROM ALL THE NUKES GOING OFF DURING THIS TIME.FROM WARS.THE HEAT WILL GET SO BAD THAT IF THE DAYLIGHT HOURS ARE NOT SHORTENED ALL ON EARTH WOULD DIE JUST FROM HEAT STROKE,NOT TO MENTION ALL THE NUKES.OK SO TO PROTECT ISRAELIS FROM DYING FROM THE HOT WEATHER. 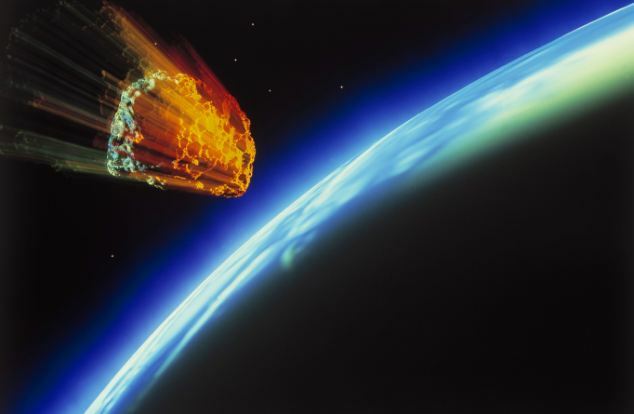 GOD WILL SEND AN ASTEROID TO HIT THE EARTH.AND LIKE THE BIBLE SAYS WILL HAPPEN.THE DUST WILL BLANKET THE EARTH AND COVER THE SUN AND THIS WILL SHORTEN THE DAYLIGHT HOURS SO THE HEAT WILL NOT KILL OFF EVERYONE ON EARTH.SO BY THE BIBLE THERE WILL ONLY BE ABOUT 4 HOURS OF DAYLIGHT AND 20 HOURS OF DARKNESS.SO WE SEE THE BIBLE DOES NOT CONTRIDICT ITSELF WHEN IT SAYS THE DAYS WILL BE SHORTENED.THE TRIBULATION PERIOD IS 7 YEARS IN TOTAL. BUT IF THE DAYS DURING THE TRIBULATION WERE SHORTENED,GOD WOULD LIE TO US BECAUSE HE SAID IT WOULD BE A 7 YEAR TRIBULATION.NOT 6 YEARS AND 7 MONTHS. SO YES THE TRIBULATION PERIOD WILL BE A FULL 7 YEARS LIKE GOD TOLD US IT WILL BE.BUT GOD SHORTENS THE DAYLIGHT HOURS NOT THE DAYS LIKE PEOPLE BELIEVE SO THAT WHEN THE HEAT IS BLARING DOWN ON THE EARTH.GOD SENDS AN ASTEROID TO CAUSE THE SUN TO BE BLOCKED FOR MONTHS SO THE DAYLIGHT HOURS ARE SHORTENED AND LIFE ON EARTH IS PROTECTED FROM THE HEAT KILLING US OFF.AND OF COURSE THE POWERS OF THE HEAVENS WOULD BE SHAKIN WHEN THE ASTEROID HITS THE EARTH JUST LIKE THE BIBLE SAYS.IT WOULD HIT LIKE A MEGATON BOMB.GOD DOES NOT LIE.THE BIBLE IS TRUTH. A 900 foot-wide asteroid will make the latest in a series of close approaches to the Earth tomorrow.Scientists have ruled out any possibility of a cataclysmic collision - yet - but there remains a non-negligible chance of the asteroid Apophis smashing into Earth in 2036.This year Apophis, named after an Egyptian mythological demon, will not get closer than around nine million miles. Scientists will use the encounter to improve their estimate of just how dangerous the space rock really is. Nasa scientists have calculated that if Apophis struck the Earth it would generate a blast equivalent to more than 500 megatons of TNT. In comparison, the most powerful hydrogen bomb ever detonated, the Soviet Tsar Bomba, released 57 megatons. In 2029, Apophis is expected to come uncomfortably close, brushing past the Earth at a distance of just 30,000 kilometres. 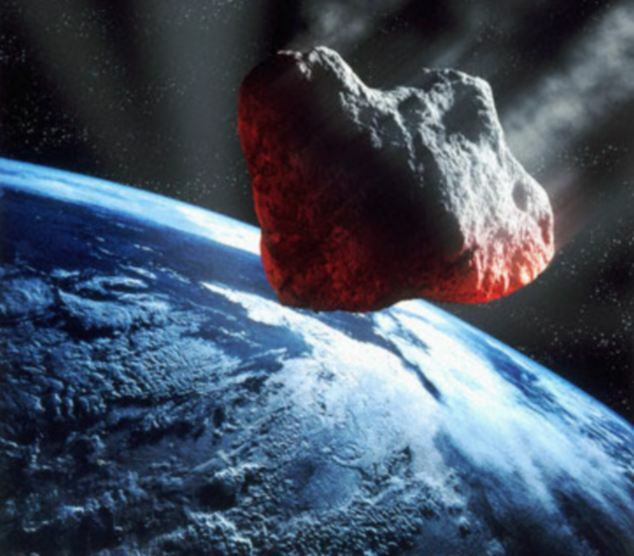 That will put the asteroid inside the orbit of communication satellites.Current models predict a tiny but real likelihood of Apophis colliding with the Earth in 2036.When the asteroid was discovered in 2004 scientists calculated a one-in-45 chance of an impact in 2029. Improved predictions later lifted the threat.The asteroid's latest near approach will occur at midnight UK time tomorrow. Members of the public can view the event online via the Slooh web-based sky-watching service, which collects images from observatories around the world.Slooh president Patrick Paolucci said: 'Alone among all these near-Earth asteroids that have passed our way in recent years, Apophis has generated the most concern worldwide because of its extremely close approach in 2029 and potential impact, albeit small, in 2036. Scientists at the American space agency Nasa have calculated that if Apophis struck the Earth it would generate a blast equivalent to more than 500 megatons of TNT. In comparison, the most powerful hydrogen bomb ever detonated, the Soviet Tsar Bomba, released 57 megatons. Dow +50 points at 4 minutes of trading today. Dow +82 points at high today so far. GOLD opens at $1,659.50.OIL opens at $93.50 today. Dow +1 points at low today so far. Dow +82 points at high today.